If you’ve got plans to head out to the old Johnson place and skim some stones or just sit awhile and wait for the catfish to bite then the waterways of Louisiana are just plum perfect. This is where the mighty Mississippi finally reaches the Gulf of Mexico and a huge portion of Louisiana’s lakes, beaches, rivers and marshlands have been formed due to the ‘Big River’s’ flow. Cities, such as Baton Rouge and New Orleans, were formed upon the Mississippi River’s banks however, many of the lakes and tributaries that you’ll find today favour recreation over industry with camping, fishing and canoeing all popular local pastimes. Lakes, in particular, form the backbone to many of Louisiana’s best-loved things to do outdoors and no matter how fast or slow you like to take life, heading lakeside has to be done if you’ve got time on tour. Below are just a few of the Louisiana lakes worth checking out and if you fancy going all Huck Finn then roll up your dungarees and tip your straw hat at a jaunty angle as this is what livin’ Louisiana style is all about. More like an ocean as opposed to a lake, the Toledo Bend Reservoir is a whopping 65 miles long and 10 miles across which makes it the fifth largest in the whole of the United States. Straddling the Louisiana/Texas border, Toledo Bend is all about enjoying the outdoor life with fishing piers, overnight cabins and camping grounds spread over 1,200 miles of shoreline. Boat, canoe and rod hire are all available and if you fancy heading in-land then TB boasts two state parks with ample tracks for walking, cycling and even off-road driving in all-terrain vehicles. Note: booking way in advance to stay within a Toledo Bend state park is definitely advisable. 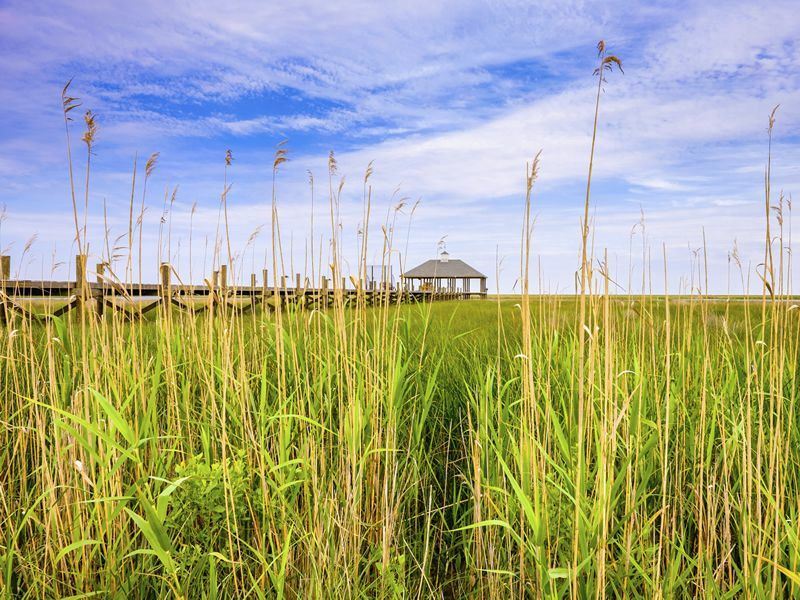 Located on the banks of New Orleans and stretching for around 40 miles and half as much wide, Lake Pontchartrain is considered to be one of the Gulf Coast’s largest wetland areas and is responsible for creating the marsh and swamp habitat for innumerate moisture-loving critters. Brown Pelicans, Bald Eagles and Alligator snapping turtles have all been found in and around Pontchartrain and thanks to several conservation and restoration programs, ecosystems are once more appearing to flourish. As the lake borders New Orleans, it’s always a popular spot to get out of the city with loads of opportunities to sail, picnic and bird-watch making it an ideal retreat on a hot and humid Louisiana afternoon. To the west of Pontchartrain, midway between New Orleans and Baton Rouge, Lake Maurepas is also responsible for much of the area’s wetland habitat and is definitely worth checking out if you fancy a paddle. Alligators, heron and snakes can all be seen along the banks of the lake and following a guide into the surrounding swamps will give you a real insight into the wildlife and conservation efforts to be found along Louisiana’s waterways. Camping, fishing and boat hire are all pretty much par for the course round these parts and if you’re looking for somewhere slightly less busy then Maurepas is certainly a good choice. If you remember your school geography lessons then you’ll already be well-versed in the joys of oxbow lakes however, for those who didn’t pay attention, a visit to False River will soon provide a path to enlightenment. Basically, it used to be one of the Mississippi’s main waterways but got cut off and since has dried into the horse-shoe shape that you’ll find today, hence the name ‘False River’. Sailing, water-skiing and fishing are all popular activities to be enjoyed along the 10 mile stretch of water and there are also a fair few restaurants, bars and b&b’s if you’re planning on staying awhile. Aside from the swamps, streams and bayous further in-land, Louisiana is also well-known for its sandy beaches which feature along the Gulf Coast. Several state parks, such as Grand Isle and Cypremort Point, always promise loads of outdoor adventures set against great coastal views with hiking trails and picnic spots combining with surfing and sailing to bring you the best of both worlds. Marinas, log cabins and camp sites provide loads of options if you fancy getting out of New Orleans for a night or two and if you’ve never experienced a Louisiana sun set before the head to the Gulf of Mexico and set your camera to stun.